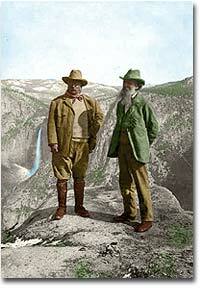 President Theodore Roosevelt with Pioneer environmentalist John Muir on Glacier Point, Yosemite Valley, California. As America grew, Americans were destroying its natural resources. Farmers were depleting the nutrients of the overworked soil. Miners removed layer after layer of valuable topsoil, leading to catastrophic erosion. Everywhere forests were shrinking and wildlife was becoming more scarce. The growth of cities brought a new interest in preserving the old lands for future generations. Dedicated to saving the wilderness, the Sierra Club formed in 1892. John Muir, the president of the Sierra Club, worked valiantly to stop the sale of public lands to private developers. At first, most of his efforts fell on deaf ears. Then Theodore Roosevelt inhabited the Oval Office, and his voice was finally heard. Roosevelt was an avid outdoorsman. He hunted, hiked, and camped whenever possible. He believed that living in nature was good for the body and soul. Although he proved willing to compromise with Republican conservatives on many issues, he was dedicated to protecting the nation's public lands. The first measure he backed was the Newlands Reclamation Act of 1902. This law encouraged developers and homesteaders to inhabit lands that were useless without massive irrigation works. The lands were sold at a cheap price if the buyer assumed the cost of irrigation and lived on the land for at least five years. The government then used the revenue to irrigate additional lands. Over a million barren acres were rejuvenated under this program. Yellowstone's Tower Falls and Sulphur Mountain, one of the earliest tracts of preserved wilderness in America. John Muir and Teddy Roosevelt were more than political acquaintances. In 1903, Roosevelt took a vacation by camping with Muir in Yosemite National Park. The two agreed that making efficient use of public lands was not enough. Certain wilderness areas should simply be left undeveloped. Under an 1891 law that empowered the President to declare national forests and withdraw public lands from development, Roosevelt began to preserve wilderness areas. By the time he left office 150,000,000 acres had been deemed national forests, forever safe from the ax and saw. This amounted to three times the total protected lands since the law was enacted. In 1907, Congress passed a law blocking the President from protecting additional territory in six western states. In typical Roosevelt fashion, he signed the bill into law — but not before protecting 16 million additional acres in those six states. Conservation fever spread among urban intellectuals as a result. By 1916, there were sixteen national parks with over 300,000 annual visitors. The Boy Scouts and Girl Scouts formed to give urban youths a greater appreciation of nature. Memberships in conservation and wildlife societies soared. Teddy Roosevelt distinguished himself as the greatest Presidential advocate of the environment since Thomas Jefferson. Much damage had been done, but America's beautiful, abundant resources were given a new lease on life. '); } } // Add extra info about the ranking, questions, and application spawn.document.writeln('\n\nWe Hope You Enjoyed the Quiz! What was the political motivation for the Newlands Reclamation Act? According to this paper by a San Francisco State University student which studies the Durham Colony of California, there was a desire to settle the land and build strong communities based on "republican" values and to limit the growth of Asian and some European immigration. It is difficult reading at times, but it is full of interesting quotations and all sources are cited. Hetch Hetchy Valley within Yosemite National Park had the right geological features to be made into a reservoir serving San Francisco, long-plagued with water shortages. John Muir and the Sierra Club vigorously opposed the damming, and the environmentalists split into two factions, preservationists and conservationists. Gifford Pinchot, conservationist, argued for putting the land and resources to use. This webpage looks at the relationship between Muir and Pinchot whose friendship dissolved over the controversy. This megasite is a treasure-trove of information on John Muir, brought to the Web by the Sierra Club which he founded in 1892. You'll find it all here, biographical information, links to dozens of Muir's writings online, brief biographies of individuals close to him, photographs, and much, much more. At the age of 8, little Teddy Roosevelt saw himself as a naturalist, opening his own "museum," and after leaving the Presidency, he traveled an uncharted tributary of the Amazon to collect museum specimens. This essay from the PBS American Experience website centers on TR's keen interest in nature and how that interest helped define America. Great reading, and some images, too. The Library of Congress has in its archives many prints and photographs, manuscripts, and other doucments related to the conservation movement in the United States. This 6-part timeline details the growth of the movement from 1850 to 1920, with links to Library of Congress materials, including 170 prints and photographs and 360 Presidential documents. This multi-page website is devoted to a detailed history of the Sierra Club, its early achievements, biographies of its early leaders, and links to even more information. Illustrated. William Henry Jackson was the official photographer for the Hayden Geological Survey and was the first to photograph Yellowstone. His photographs and paintings introduced many easterners to the majestic beauty of the western United States, and he contributed to the creation of Yellowstone and Mesa Verde National Parks. This online exhibit from the University of Wyoming showcases some of Jackson's photographs and paintings. As President, Theodore Roosevelt created 16 national monuments, 51 wildlife refuges and 5 national parks. For a breathtaking view, check out this webcam at Yosemite Valley! If you like our content, please share it on social media! 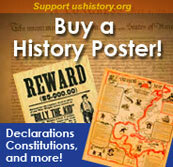 Copyright ©2008-2019 ushistory.org, owned by the Independence Hall Association in Philadelphia, founded 1942.